Using the JustOn Self-Service Extension you set up a public web application based on Force.com Sites. This section describes how to set up the site and the required security settings. Depending on the intended feature scope, the setup steps to take or their complexity may differ. This documentation indicates the scope-related specifics when applicable. The JustOn Self-Service Extension requires at least the Salesforce Enterprise Edition. Contact the JustOn support team to have the add-on installed in your org. Usually, the extension is installed using the security option Install for Admins Only. Depending on your business, this may require configuring additional user and object permissions after installation. For details, see Installing Packages in the Salesforce Help. Once the site setup, access settings and license assignment as described on this page are complete, make sure to define a value for the Redirect after login global setting. The extension is designed to use a Force.com site exclusively. JustOn recommends not to use it together with other Visualforce pages. You can reuse an existing Force.com site or create a new one. Irrespective of the intended feature scope, you need a dedicated site. In Setup, open the Sites page. Type Sites in the Quick Find box, or navigate to User Interface > Sites and Domains > Sites. If necessary, register a domain name. Apply the following settings, then click Save to complete the site creation. URL Rewriter Class URLRewriter Required for the proper functioning of the payment page. For the proper functioning of the payment page, you must define the new site's URL as the base URL for JustOn. Copy your new site's URL. Click Manage in the row of Global Settings (for JustOn). Paste the copied URL into the field Base URL. Make sure to end the Base URL entry with a trailing slash /. 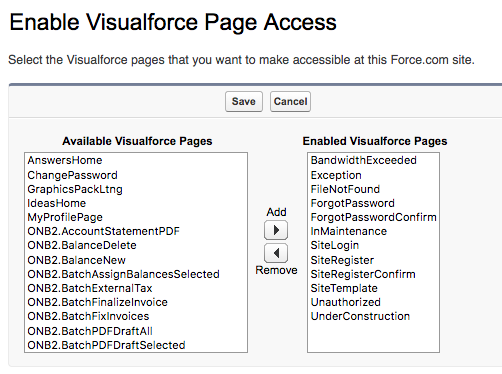 You must add a number of Visualforce pages to the new site. Leave the following default pages enabled. The extension needs access to a number of standard objects and custom objects in order to work correctly. To this end, you must allow/restrict access both on object and field level. Make sure to grant the access rights as restrictive as possible to avoid inadvertent information disclosure or modification. If you use the Enhanced Profile User Interface, click Object Settings > Object > Edit. Apply the following object permission settings. Create For the payment integration, Read access is sufficient. Price Book Read Required when using master products. Price Book Entry Read Required when using master products. Product Read Required when using master products. All other objects must not be selected. In the Original Profile User Interface, scroll to the Field-Level Security section, click View next to the object you want to modify, and then click Edit. Specify the required access levels. Required when using master products. Your business may decide to use Stripe as a payment provider. If you do so, you must enable the Apex class ONBSE1.StripeWebhookHandler for your site in order to completely support the integration. In the Original Profile User Interface, scroll to the Enabled Apex Class Access section, and then click Edit. If you use the Enhanced Profile User Interface, click Apex Class Access > Edit. Add ONBSE1.StripeWebhookHandler to the Enabled Apex Classes list. To apply this configuration, your site must be set active. To successfully finish a payment, the site guest user needs additional permissions for a number of objects and fields. Due to restrictions in Salesforce, a part of the required permissions must be configured manually, others are already bundled in the permission set PaymentGuest, which is shipped with the JustOn Self-Service Extension. You can, for example, clone the PaymentGuest permission set, and then add the required additional permissions to the created copy. Configure the additional object settings in the new permission set. Click Object Settings > Object > Edit, and apply the following object permission settings. Invoice Read Required for invoice-specific payment configurations. Make sure that Read access to the PaymentProviderOverride field is enabled. In the Original Profile User Interface, click View Users. If you use the Enhanced Profile User Interface, click Assigned Users. Open the details of the Site Guest User, and scroll to the Permission Set Assignments section. Select both the permission set PaymentGuest and the custom permission set created before, and click Add. The user of the Force.com site needs a JustOn license. Open the details of the Site Guest User, and scroll to the Managed Packages section. Select the JustOn package, and click Add.